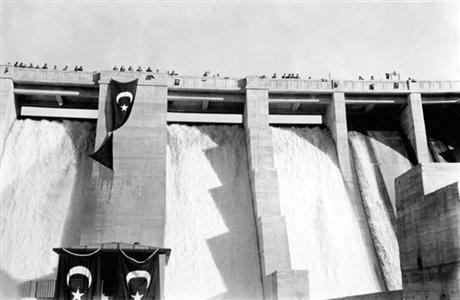 The building of dams has been seen as essential to Turkey’s modernization and development since the early days of the Turkish Republic, when the nation’s capital was established in arid Ankara rather than waterfront Istanbul. Dam-based infrastructure to bring irrigation and drinking water to Ankara in the 1930s was quickly replicated around the country, a process documented in “Modern Essays 5: Graft,” an archival exhibit currently on display at SALT Galata in Istanbul. Curator Demirtaş has compiled black-and-white photographs of families posing proudly in front of dams in the 1940s and 1950s; old newspapers with full pages of photos showing people enjoying recreational opportunities in the country’s new reservoirs; scale models of the 42 dam lakes on the Tigris and Euphrates, including the yet-to-be-filled Ilısu; and her video interview with Demirel, who presided over Turkey’s dam building agency before becoming president. 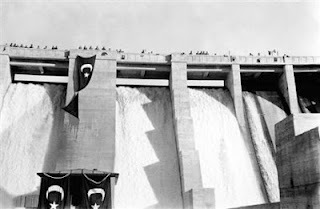 In the video, Demirel concedes a few qualms about relocating people and other negative impacts of dams, saying “some projects may take away more than they bring,” but remains firm in his conviction that Turkey’s hydro projects have been key to its drive for modernity and civilization. 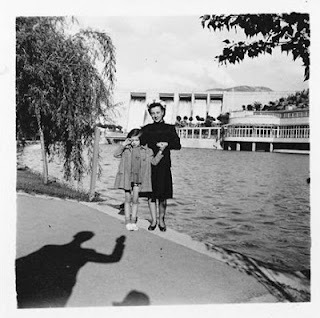 The entire exhibit – which also includes a touchscreen display on which visitors can access a database of the country’s dam lakes – indeed explores how deeply entwined such projects are with national identity and pride, and not just for Turkey. To successfully propose alternatives, it seems a new, and equally convincing, national narrative about development and what it means may have to be created. The exhibit “Modern Essays 5: Graft” ends this Sunday, August 26, but the dam database (in both Turkish and English) will remain available online. Jennifer, Yes, you are certainly right about changing ideas about what constitutes positive development for humanity. And not just in Turkey. I think it's true that everyday people like villagers on the Black Sea fighting hydroelectric power plants are rethinking these things. So there are signs of hope. If only money didn't talk so loudly . . . .